Mixing survival gameplay with a narrative is always a tough task for developers, but it’s one the creators of We Happy Few takes on. I’m 10 hours into their game, which is out today for Xbox One, PS4 and PC, and I’m both charmed and frustrated. The writing is excellent, and the visuals are spectacular, but the clumsy gameplay makes appreciating these things difficult. We Happy Few was announced in 2015 and came to Steam Early Access in 2016. It had a rocky start: early players weren’t fond of its survival elements, and the developers refigured the game over the ensuing two years, coming out with a more narrative-focused experience with procedurally-generated environments and a dash of survival. Now, players control three characters across the story, each of whom is going against the grain of the dystopian 60s English society of Wellington Wells. Following a tragedy, citizens are mandated to take Joy, a drug that turns their bleak, crumbling surroundings into a psychedelic wonderland, but the three player-characters want none of it. I’ve only played as the first character, Arthur, who stops taking his Joy and is forced to flee his job as a newspaper censor. Arthur is an everyman in the extreme, which helps him blend in—if he sits on a bench and opens the paper, he can basically disappear. He’s not much of a fighter. He fumbles through We Happy Few’s clumsy combat and worries to himself when he kills people. He’s fun to play given how much he feels like a regular person thrown into a bad situation, and I’ve been charmed by his mix of English stoicism and his outbursts of emotionality. But the game’s exacting stamina meter hampers him a bit too much, making stealth your best bet as you steer him through the story. The world of Wellington Wells is tangled and fascinating, full of well-written characters who are bursting with personality. Unfortunately, my interactions with these characters have mostly boiled down to fetch quests: they ask for something, and I creep around until I get it, and then creep back. Quests give you points that you can use to upgrade Arthur, giving him the ability to choke enemies or hit a bit harder, but none of this has grabbed me. The world is fairly simple to traverse, if not always engaging. You can hide in only one sort of bush, usually conveniently placed to show you where to go. Non-player characters will turn on you in a heartbeat, but they’ll lose sight of you quickly if you simply run away. In more populated areas, you can pop a Joy (which comes at a health cost if you take too much) and stroll along the streets undisturbed, or you can stick to the side streets. As long as you behave—keep your clothes clean, don’t run or jump or creep—you’re mostly fine. This is the bush you can hide in. Wandering Wellington Wells is tense, but also too constraining. The most interesting part of We Happy Few is its world, and while the city I’ve been in has had more impassable buildings than I’d like, I’ve mostly wanted to watch the televisions, listen to the music, and poke around everything for crafting items. You can’t do this easily. You’ll find yourself in trouble if you linger too long. Coupled with the game’s strange save system—no quick save or quick load, respawns in odd places or without needed items—it’s been more expedient for me to just complete the quests as quickly as I can, including simply running for my objectives. 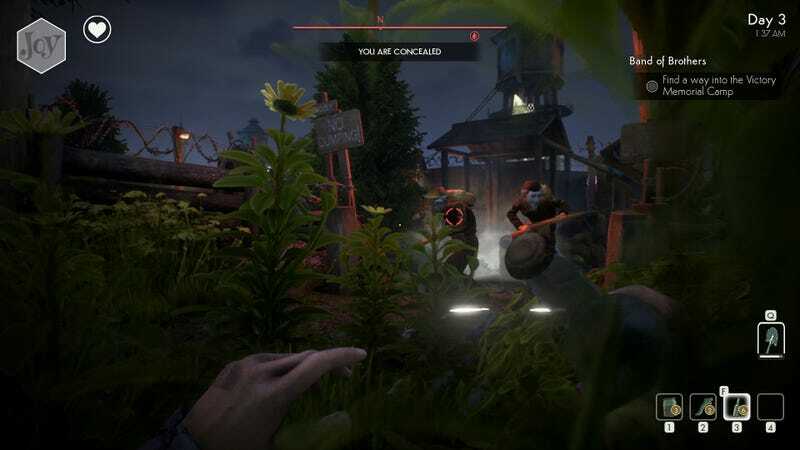 Stealth games often let you find new parts of a game’s environment to explore and exploit, but in We Happy Few stealth is too rudimentary and straightforward to give me any more insight into the world around me. The survival elements, which first drew me to the game, are equally disappointing. Instead of needing to eat, drink, or sleep to survive, you get a debuff if you ignore your needs for too long. This can be tweaked in custom settings, but as a go-to it’s more an annoyance than an interesting mechanic. It’s confusing to see dramatic red indicators announcing I can sprint a little less next to more serious conditions like the fact Arthur is bleeding out. I found it hard to have a clear grasp on the severity of my condition, which caused me to sometimes die for unknown causes or not treat more serious ailments because I lost track of them in the flood of other indicators. The version I played, which included the day zero patch, was full of missing sound cues and buggy AI behavior, but We Happy Few has a lot of charm under the mess. Its sandbox mode (unavailable when I played) might let me turn it into the open-world survival game I initially wanted it to be, even if other players didn’t. In terms of its appearance and its writing, We Happy Few is an admirable change of pace, but the gameplay lags behind the presentation. I’m going to keep playing to see if things pick up in the other characters’ stories, but what I’ve played so far has been uninspiring.